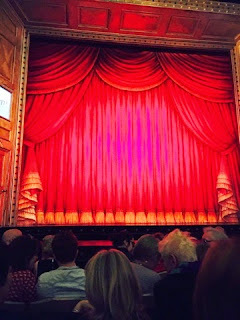 Last night Stuart and I went to see Gypsy at Savoy Theatre in London's glitzy West End. Not since her performance as Mrs Lovett in Sweeney Todd have we seen Imelda Staunton deliver such a knock‑out performance as she does as Momma Rose in Jonathan Kent’s dazzling revival. It was a complete "wow!" At the end of act one as Ms Staunton belts out the show-stopper Everything's Coming Up Roses - such is the skill and power of her performance - you feel every raw emotion that Momma does. In just this one song she manages to convey perfectly the frightening destructive iron will-power, the monstrous blind ambition and the naked aggression of the pushy show business mother. A triumph. 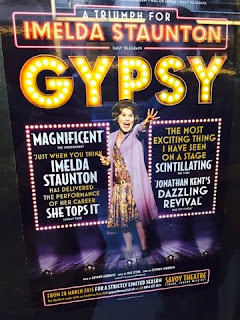 Gypsy is one of the greatest ever Broadway musicals and this transfer to the West End follows its sell‑out, rapturously acclaimed five‑star run at Chichester Festival Theatre. It was simply a joy from start to finish. Based on the true life memoirs of legendary burlesque entertainer, Gypsy Rose Lee, it tells the tale of Momma Rose and her two daughters, Baby June and Louise, trekking across America in their family vaudeville act. But times are changing, audiences are expecting more, and the two girls have their own ambitions in mind. The rise of burlesque is upon them, and nothing will ever be the same again for Momma Rose. Alongside Ms Staunton is Lara Pulver who reprises her stunning role as Louise. They were joined on stage by ex-Timelord Peter Davison as Herb and they all danced to the marvellous choreography from Stephen Mear. 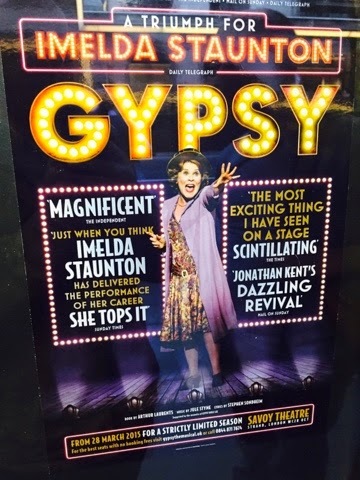 With lyrics by Stephen Sondheim, book by Arthur Laurents and music by Jule Styne, this moving and scintillating production of Gypsy is the first to be seen in London for 40 years. Let's hope we don't have to wait as long again.